Bound by geography, culture, and tradition to our national experience, the Gulf of Mexico is "America's sea." Jack E. Davis places this exceptional region into the American mythos in a sweeping work that extends from the age of the conquistadors to the present day. Exploring both its natural wonder and our human connection with the sea, Davis recounts an astounding narrative-the sport fish that brought the earliest tourists, Hollywood's role in the first offshore oil wells, the presidents who directed western expansion toward its shores, and the industries that sent their contamination into the estuarine wonderland. 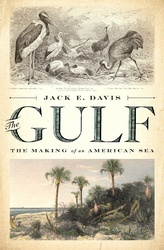 Revealing both its beauty and its ruin, Davis reminds us that the Gulf is an ongoing story central to the American experience. Jack E. Davis is the author of numerous books, including the award-winning An Everglades Providence: Marjory Stoneman Douglas and the American Environmental Century. A professor of environmental history at the University of Florida, he grew up on the Gulf coast, and now lives in Florida and New Hampshire.